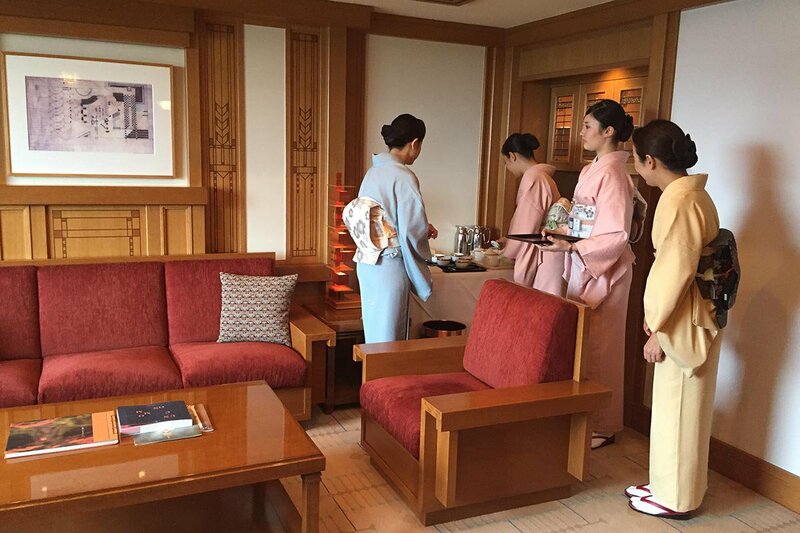 Geishas in action at the Imperial Hotel's Frank Lloyd Wright Suite. All photos by Berit Baugher. In East Tokyo, old businesses are modernizing in new ways and new businesses are celebrating old traditions. Bookmark this hit list for your next visit. TOKYO – Japan's capital is a city of contrasts. Towering skyscrapers overlook remnants of the country's Edo period; streets lit by flashing neon lights lead to tranquil Japanese gardens; and century-old traditions mix with new innovations. To experience these contradictions at their best, head to Tokyo's east side, where old Japan and new Japan seamlessly mix together. Boarded by the Imperial Palace and the Sumida River, East Tokyo is home to one of the city's most fascinating relics. Opened in 1890 to welcome foreign visitors in search of modern luxuries, Imperial Hotel was rebuilt two more times — first and most notably by American architect Frank Lloyd Wright in 1923, and then again in 1970, when the structure had to be replaced. With over 125 years of uninterrupted service, the hotel guest list reads like a who's who of modern history. Marilyn Monroe and Joe DiMaggio visited on their honeymoon, Hellen Keller stopped by on a lecture tour through Japan, and Babe Ruth played with young fans in the hotel garden. Today, the hotel is thoroughly modern with an indoor pool, WiFi, and more dining options than you can count on two hands. On a three-night stay, it was the Japanese tradition of omotenashi that stood out to me most. Loosely defined as the art of selfless hospitality, no task is too small. For the past thirty years, the pink rosebuds scenting the elevators have been replaced several times a day to ensure freshness. Doorman put on a new pair of white gloves every half hour so they don't dirty luggage. After a delivery, staff bow deeply in front of closed guest room doors. Small — even unseen — tasks are of the utmost importance. For those staying elsewhere but looking to experience the hotel's hospitality and Frank Lloyd heritage, head to Old Imperial. The cocktail bar is a throwback to 1920s Japan with bartenders in bow ties, a mural made from the Oya stone used in the old hotel, and original lighting fixtures. A steaming bowl of white rice accompanies just about every meal in Japan, including those at Akomeya Chubo, a small restaurant housed inside gourmet food shop Akomeya Tokyo. Order the kobachi-zen set for lunch. The classic Japanese comfort meal includes eight small dishes (some cold and some hot), miso soup, white rice, and pickles. After lunch, take a spin around the impeccably curated gourmet food shop. A stunning bamboo bar sells premium rice from all over Japan alongside traditional packaged foods like umeboshi and ramen, Japanese cookware, and small gift items like bento bags and sake cups. On a busy street in Ginza, a nondescript elevator leads to an elegant sweet shop and tea salon called Higashiya. 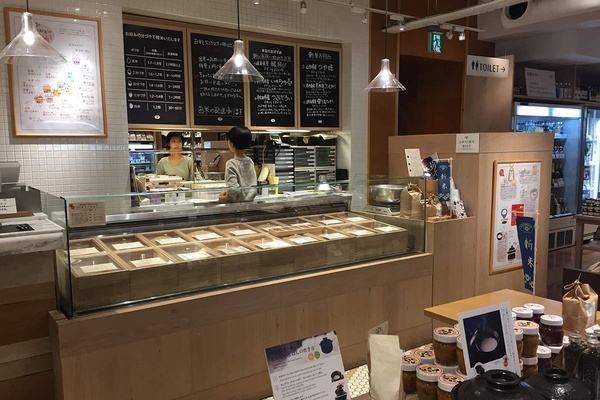 Specializing in modernized versions of wagashi, the treats are made from traditional Japanese ingredients like red shiso and azuki beans in small, contemporary designs. Go for the 30-plus varieties of green tea and pick up a selection of the artfully packaged sweets as gifts. The rice bar at Akomeya Tokyo. In contrast to the modern surroundings of Ginza, the Okuno Building (Ginza 1-9-8, Chuo-ku) is a visual highlight for those who appreciate historic buildings. Having miraculously survived the bombings of World War II, today the old Art Deco structure houses a small community of artist studios and speciality shops that are open to the public. The hallways look and feel haunted, so unless you are super adventurous, I would recommend exploring with a friend. 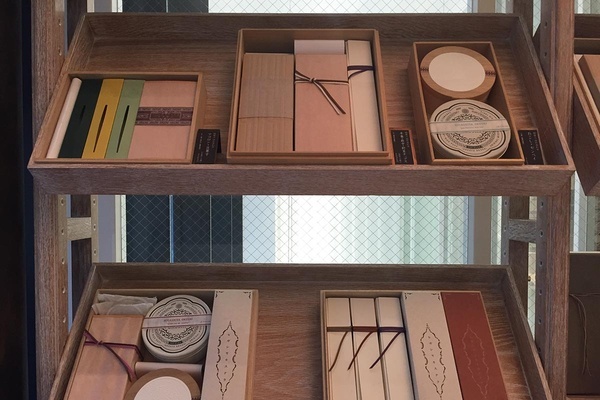 For authentic Japanese crafts with a modern spin, head to Nakagawa Masashichi Shoten. The 300-year-old crafts-revitalization business finds the best goods from around Japan and in many cases helps them rebrand their products to appeal to a modern audience. Look out for Kungyokudo, a 423-year-old traditional incenses producer that recently had their logo reworked by the company. ANA recently launched direct flights from New York's John F. Kennedy International Airport (JFK) and Chicago's O'Hare International Airport (ORD) to Tokyo's Haneda Airport (HND). Less than thirty minutes from Tokyo's city center, Haneda Airport is the most convenient of the city's two airports.